This section will be updated soon. 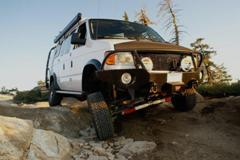 For now I’ll just say I’m a native Californian and have been active in off road travel and camping all my life. I purchased my Sportsmobile in 2005 and have enjoyed every trip I’ve taken. I hope you will find the site useful. Thanks for visiting.